Exercise is good for the body and most people especially those with six packs (v-shaped) body or girls with nice figures do not joke with their daily work out. But for new guys who want to visit the gym either for the first time or regularly, there are some mistakes that should be corrected or avoided. 1. Doing too much: It will be a mistake on your part if you do too much exercise because you want to lose weight especially for men. You only do your exercise in moderation and not overdo it. 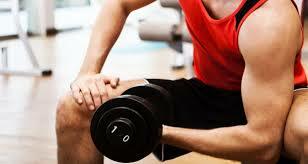 Overdo of exercise will cause pains, strains, stress or fatigue which is bad for the body. 2. Listening to the wrong advice: Listening to wrong advice is also a terrible mistakes made by people during exercise. You do not need to listen to people because it works for them, what you need to do is to visit the fitness expert and let such suggest the best work-out fr you, this protect you from body disfigure. 3. Relying on cardio: Cardio exercise are exercise that makes you breath faster, reduces weight but may not be the solution to your need. What you required may not even need a cardio but a simple exercise will do. 4. Lifting too much weight : All because you want some biceps, v-shaped figure, six packs etc, it will be a mistake when you do so because you will experience strain, pains, fatigue etc. What you need is a moderate excess and you get the result. 5. Ignoring compound exercises: Some people really do not know hoe effective a compound exercise could be. Compound exercise such as jogging, running, skipping etc all work well and give better result n the body. 6. Neglecting Nutrition: One of the crucial mistake people do during work out or exercise is to skip food especially for weight loss. If you heard it somewhere that ignoring or skipping food is the best, then its a bad one. Just eat balance diet, do exercise and you will get the best result. 7. Depending heavily on supplements: There are many drug marketers who claim to have a drug or food supplement that can help you lose weight, keep fit or achieve results. Many of these drugs don't really work but to get slimmer and trimmer, you need to d exercise. 8.Quantity over quality: Quantity means number of times and quality has to be "best" To achieve success, you need to do the best and not frequency or number of time you d the exercise. These are mistakes made by people during exercise and all these may not allow them achieve fast result. Think about the health ideas given above, implement some and you will see the change when you do so.